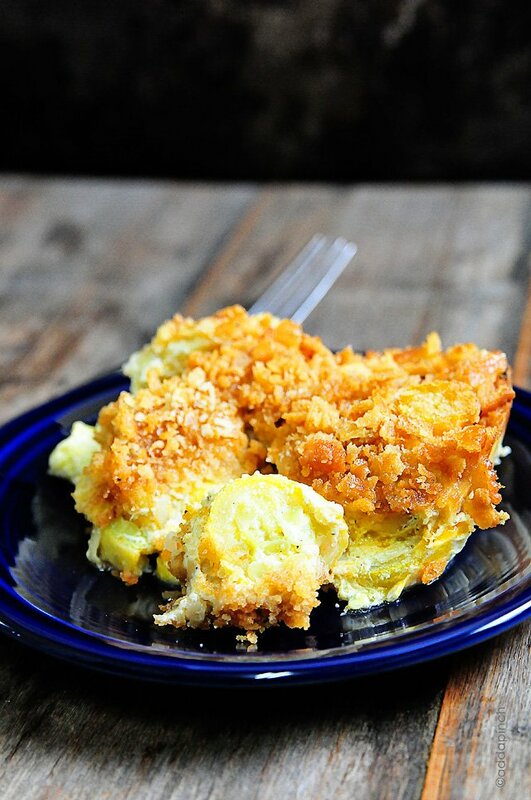 Squash Casserole is an essential dish for holidays and special meals. Topped with a buttery cracker topping, this squash casserole recipe is a delicious all-time favorite! 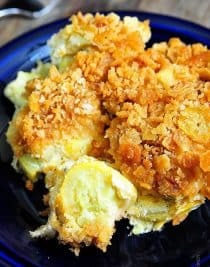 Squash Casserole is a one of those recipes that you’ll find for nearly every holiday, reunion, or special occasion when my family gets together. To say that this recipe is a staple family-favorite would be a definite understatement, actually. I’m sure if you’ve been to a southern family reunion anytime in your lifetime, you’ve most likely noticed the squash casserole dishes that always appear. And then disappear just as quickly. It’s just one of those recipes that is a foolproof crowd pleaser. And this recipe is exceptionally delicious and frequently requested! And this recipe is so versatile too! It’s perfect for feeding large groups of people. It’s just as perfect for feeding a family for supper too. Just simply divide this recipe for a smaller weeknight side dish to enjoy anytime! Preheat your oven to 350 degrees Fahrenheit. Melt 2 tablespoons of butter in medium skillet or saute pan over medium-low heat. Add squash and onions and cook until tender. Lightly whisk eggs in a large bowl. Add cheese and milk and whisk into the egg until well-combined. Add cooked squash and onions to egg mixture and stir well to combined. Melt remaining 2 tablespoons butter in skillet used to cook squash and onions. Add that melted butter to the squash casserole mixture. Add cayenne pepper, if using, along with salt and pepper. Stir well to combine. Spray a 9×13 casserole dish with cooking spray and pour squash casserole mixture into the baking dish. Top evenly with crushed Ritz crackers. 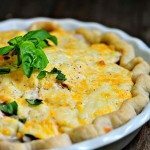 Place casserole in a preheated oven and bake 45 minutes, or until top has lightly browned and casserole does not shake when the dish is moved. Allow cooked squash casserole to sit for about 3 minutes before serving. Prepare casserole according to the recipe instructions, except wait about adding crushed Ritz cracker topping. Wrap uncooked casserole well with freezer wrap before freezing. Thaw casserole overnight in the refrigerator the night before serving. Add crushed Ritz crackers to top of thawed squash casserole and bake according to recipe instructions. Enjoy! Here’s my family’s squash casserole recipe. I hope you love it as much as we do! 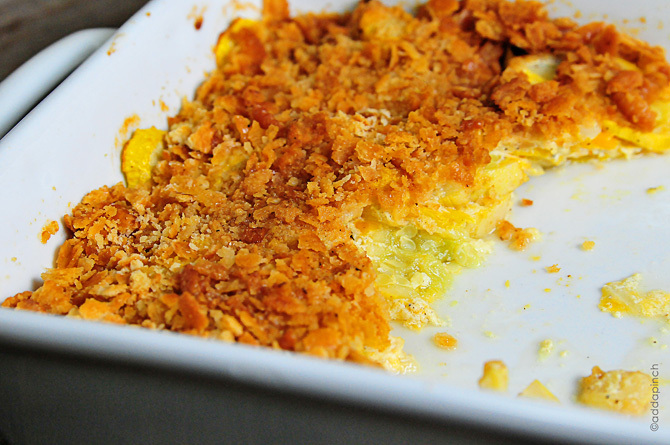 Squash Casserole is an essential dish for holidays and special events. 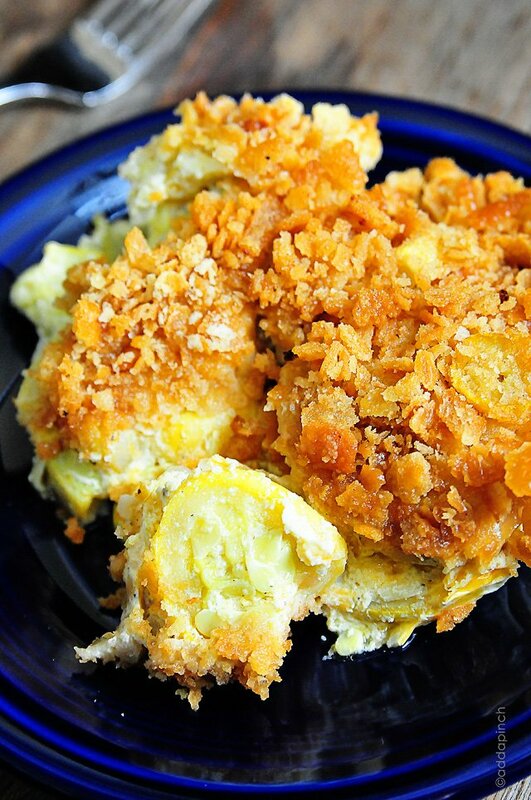 Topped with a buttery cracker topping, this squash casserole is an all-time favorite! Melt 2 tablespoons butter in medium skillet or saute pan over medium-low heat. Add squash and onions and cook until tender. To a large bowl, add eggs and lightly whisk. Add cheese and milk and whisk into egg until well-combined. Add cooked squash and onions to egg mixture and stir well to combined. Melt remaining 2 tablespoons butter in skillet used to cook squash and onions. Add to squash casserole mixture. Add cayenne pepper, if using, along with salt and pepper. Stir well to combine. Spray a 9x13 casserole dish with cooking spray and pour squash casserole mixture into the baking dish. Top evenly with crushed Ritz crackers. Place in preheated oven and bake 45 minutes, or until top has lightly browned and casserole does not "jiggle" when the dish is moved. 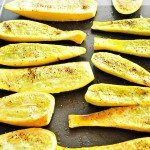 I love to freeze precooked squash with onions just for this dish! Made it and loved it. Making again today. 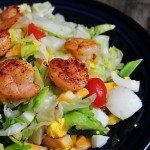 Great low carb and low sugar recipe. Will be definitely trying this out today, adding a bit of fresh spearmint as well;) Thanx so much for the delicious recipe, greetings from sunny Greece! It was fantastic! 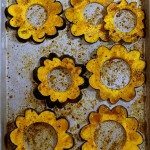 We sliced the squash using a mandolin to get thin slices and also tried a little Parmesan with it. Delicious, thanx for the delicious recipe! I have made this a couple of times and it was a huge hit. I love this recipe. For KETO: I subbed the ritz crackers with crushed pork rinds, Added 1/4 cup heavy whipping cream and 4TBSP cream cheese. Made this two nights in a row. Delicious!! I made this tonight. Delicious! Thanks for sharing Robyn. Excellent recipe. Grandkids that don’t like squash ate it up! Im assuming i could use zucchini instead of yellow squash? I’m about to try halving the recipe and plan to use diced yellow squash and diced zucchini. Can’t imagine that it’ll be anything but great!! This is an easy and very good squash casserole. This is the best recipe. Everyone in my family love it! After reading the reviews with all the positive comments i am going to make this today and then will give my yeah or nay. It is amazing. Made it twice in one week. My husband and I love it. This recipe is a keeper. I like the mild flavor and that the ingredients are what is usually already in the refrigerator. I did use all the butter to saute, added paprika and parsley to the squash as it was cooking and also the salt and pepper. Removed the pan from the burner and let it cool while the oven heated, and then mixed the milk, eggs and cheese in a one quart measuring cup, then stirred it into the pan. Came out delicious. Thanks for such a good recipe. This recipe is a perennial favorite for the holidays. It is quite close to the long-time family recipe that my Mother passed down to me years ago. Over the years, I’ve improvised based on what’s on hand as well to experiment with different flavors. Sometimes I combine zucchini squash and the summer squash and onions and add bit of garlic to the saute; sometimes I steam the squash & onions then add a bit of garlic powder or granulated garlic to the egg & milk mixture. Sometimes, I add a bit of sour cream to the egg & milk mixture. If no, Ritz cracker, I’ve used breadcrumbs or Saltine crackers or even finely crumbled store-bought stuffing mix. Thanks Robyn – I love your recipes! Absolutely the best to make, serve, freeze…just delicious all around!!! Thanks so much. Do you need to cover the casserole when baking for 45 minutes? You do not cover the casserole. Hope you enjoy it! Thanks! I ❤️ squash casserole and I think I make it differently each time. Made this today for church potluck and people asked for the recipe. I used a bit more butter and cooked the fresh squash down a little more but it was a hit. Thank you! Can I double this recipe? I’m hosting a large crowd at Thanksgiving. You can certainly double the recipe if you wish. I often just make two dishes (or divide the doubled recipe into two dishes) of it when feeding a crowd so that each bite has a good ratio of that crunchy delicious topping. I hope you enjoy it! Thanks! Can this be refrigerated uncooked without t hd e crackers, then bake the next day? Yes, you can do that SD. Enjoy! In the past I’ve added sour cream and cream of chicken soup to squash casserole. When I completed this recipe and prepared for freezer, it dawned on me that I had not added either one and reviewed the recipe to make sure I had followed the steps. The additions of sour cream and soup makes this very rich – almost too much. How does this compare? Also, the liquid mixture is thin. The picture looks perfect. 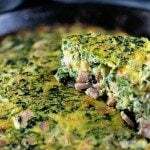 After cooking and setting does the casserole liquid thicken? Sorry so long. Thank you. 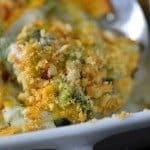 I’ve always made my squash casserole by this recipe and have never made it with those ingredients you’ve mentioned, so I can’t say how they compare. Except I can say I don’t find my recipe to be thin. This recipe has been in my family for generations and is one of our favorites. Hope you enjoy it! Thanks! I made this for Easter lunch & it was a hit. This dish will be a new holiday tradition! I made it just like directions said. Easy & yummy! Thanks for sharing Robyn!